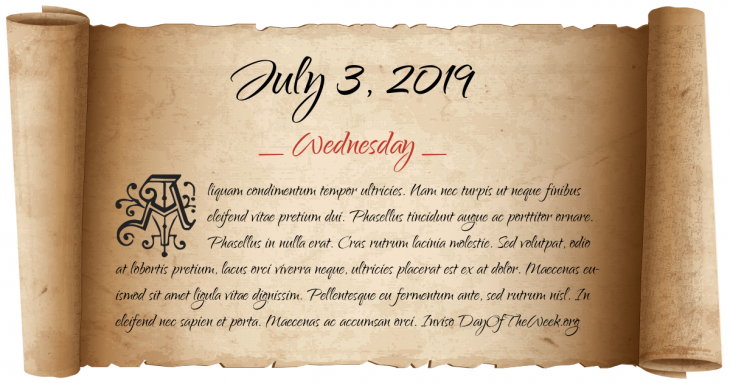 What Day Of The Week Is July 3? French and Indian War: George Washington surrenders Fort Necessity to French forces. Congress establishes the United States’ 2nd mint in San Francisco, California. Karl Benz officially unveils the Benz Patent Motorwagen – the first purpose-built automobile. Spanish-American War: The Spanish fleet, led by Pascual Cervera y Topete, is destroyed by the U.S. Navy in Santiago, Cuba. World War II: the French fleet of the Atlantic based at Mers el Kébir, is bombarded by the British fleet, coming from Gibraltar, causing the loss of three battleships: Dunkerque, Provence and Bretagne. One thousand two hundred sailors perish. Who were born on July 3?